From goodreads: Emma leaves Weslyn and everyone in it behind to attend Stanford University, just as she always intended. A shell of her former self, she is not the same girl. She is broken, and the only way that she’ll be whole again is through forgiveness. Emma must find a way to forgive herself and recognize her own worth before she can receive the love she deserves. After waiting a little over a year for Out of Breath, I couldn’t be happier to have finally read it. I’m emotionally exhausted but nevertheless happy! Emma broke my heart all over again and it was eye-opening that Evan struggled as much as he did. One of the many things I enjoyed about this book was Evan’s POV. It was necessary and incredibly appreciated to hear his thoughts and feelings surrounding his love for Emma. Surprisingly enough I found out that Evan isn’t perfect either and I like knowing that little fact, actually I loved it because “perfect” is boring but flawless can be so much more interesting. 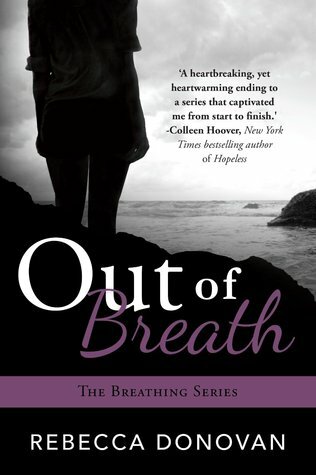 Emma is still very much broken in this third and final book of The Breathing Series and there were times when I was frightened for her, like really frightened. Her choices were giving me a major anxiety attack the entire time…someone pass me the Xanax!!! She was a train wreck waiting to happen and that’s putting it mildly. This series went from dark to darkest and I wasn’t sure that Emma would survive but other readers kept reassuring me that they would get their HEA…thank goodness because my heart can only take so much. This story is slow building and intense as they others but there was something missing from this particular book that left me unsatisfied. I wanted more with Jonathan and there were so many unanswered questions with regards to Emma’s relationship with him. He was such a pivotal character in Barely Breathing (#2) that to have him as a voiceless character in Out of Breath left me disappointed. Lastly, the epilogue was too brief and I was left to imagine all the happy possibilities of Evan and Emma’s life together…I wanted more, I needed more. With all that being said, this is a fantastic ending to a painful journey and the writing is equally as fantastic. The flashback sequences are weaved in seamlessly and it ties everything together beautifully. Rebecca Donovan does an excellent job in making you feel every heartbreaking moment throughout this entire series and I’m glad I read all three books and I hope Jonathan gets his own series. His story should be shared…I need his story!! !